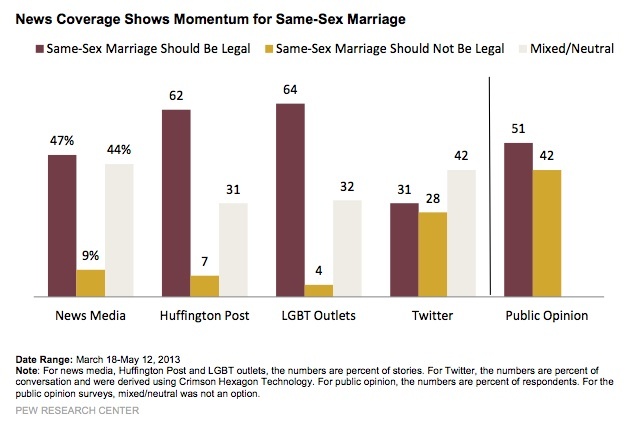 A new Pew Research report reveals what every supporter of real, heterosexual marriage already knows full well- that all aspects of mainstream media are skewed to inflate the actual reality of public opinion in support for gay marriage. If you are short on time you could stop after reading the title, “Far More Coverage Of Gay Marriage Cases Focused On Support Than Opposition”. The Supreme Court will likely hand down decisions on two major cases regarding gay marriage this week. Bloggers, networks and print media are abuzz with speculation over what the high court will decide and what impact it will have on the debate at large.